In his new book, William J. Bernstein, the celebrated author of A Splendid Exchange, chronicles the history of media, starting with the origin of writing thousands of years ago in Mesopotamia. The revolutionary tool gave rise to the worldâs ancient empires. And when Phoenician traders took their alphabet to Greece, literacyâs first boom led to the birth of drama and democracy. But itâs not just new communication technologies that have changed the worldÂitâs access to them. Vernacular bibles gave rise to religious dissent, but it was only when the combination of cheaper paper and Gutenbergâs printing press drove down the cost of books by 97 percent that the fuse of Reformation was lit. The Industrial Revolution allowed information to move faster and farther than ever before, though it concentrated power in the hands of those who ran radio and TV stations, large newspapers, and then, totalitarian governments. With the twenty-first century boom of the mobile Internet, control of media has again spread, and the world is both more connected and freer than ever before. 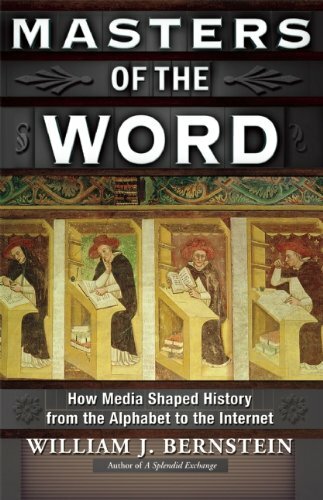 An utterly captivating, enlightening book, Masters of the Word will change the way you look at technology, human history, and power.